Home Health Measles cases have hit a record high in Europe. Blame austerity. Europe is in the midst of a massive measles outbreak, with more than 41,000 cases reported in the first half of this year. The deadly virus has spread to 21 out of 30 countries in the region, and the World Health Organization says cases have hit a record high, with more than Europe’s annual total during the past five years. This week, England’s National Health Service announced that its ongoing outbreak involves 876 cases — more than three times the 2017 amount. 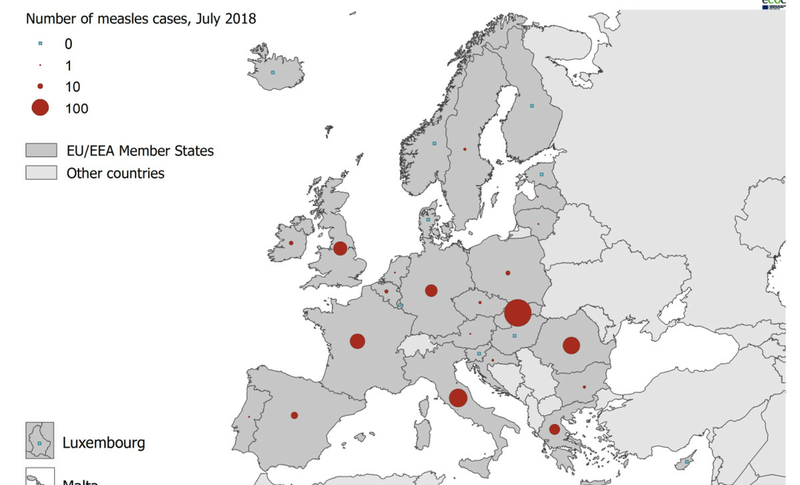 Measles in Europe, July 2018. Measles can be deadly (34 people died in Europe in the first half of 2018). It’s also one of the most infectious diseases known to man. A person with measles can cough in a room and leave, and if you are unvaccinated, hours later, you could catch the virus from the droplets in the air the person left behind. The good news: We have a vaccine that’s highly effective and can prevent measles spread. So what gives? In the press, Europe’s measles problem has been attributed mainly to parents refusing vaccines for their kids and who’ve been spurred on by the populist movement and anti-science rhetoric there. Russian trolls spreading disinformation have also shared some blame. And then there’s Andrew Wakefield, the discredited physician-researcher from Britain. With a small and fraudulent study, Wakefield helped perpetuate the myth that the measles-mumps-rubella (MMR) vaccine causes autism and ignited the modern anti-vaccine movement (even recently fanning a measles outbreak in Minnesota). It’s true that coverage rates for the MMR vaccine have dropped in Europe. England just released new data showing a decline for the fourth year in a row. But what’s happening in Europe is a lot more complicated than populists or anti-vaxxers like Wakefield. That simple narrative isn’t quite accurate anymore. Just look at what’s happening in Italy, Ukraine, England, and Greece to understand why. In other words, an underfunded public health infrastructure may be more to blame for the uptick in measles than anti-vaxxers. “The [public health spending] cuts were mainly on prevention — like preventive clinics and also staff,” the study’s lead author, Veronica Toffolutti, a health economist at Bocconi University in Milan, told me. “Many people were not hired anymore as staff.” And without staff and services in place to vaccinate people, more people aren’t getting vaccinated, and measles is spreading. Ukraine has registered about half of Europe’s 41,000 cases. “In Ukraine, there’s anxiety about the MMR vaccine and child development,” Heidi Larson, a vaccine confidence researcher at the London School of Hygiene & Tropical Medicine, said. Even more important: “They have a history of supply problems.” These irregular supplies date back to Ukraine’s separation from Russia, and it’s propelled the spread of measles there. When asked by the Guardian about why people weren’t getting vaccinated, experts in England spoke mainly of an increasingly strapped and fragmented National Health Service, the country’s public health system. They also mentioned the fact that there is no system in place to remind people to get their shots, among other barriers to access. “The government needs to work with the NHS and local authorities to prioritize immunization services and learn lessons from regions that are performing well,” Doug Brown, the chief executive of the British Society for Immunology, told the Guardian. The measles problem that’s surfaced across Europe might mean that even more vaccine-preventable diseases — rubella, mumps, diphtheria, hepatitis — could begin to rise, since measles is typically the first to start spreading when people aren’t getting their shots. That’s because measles is incredibly infectious and needs the highest amount of coverage to give the population something called herd immunity: In order for any vaccine to be effective, you need to have a certain percentage of people in a population immunized. This means diseases can’t spread through populations very easily, and it protects even those who aren’t or can’t be vaccinated. With measles, 95 percent of people need to get the shot to prevent the virus from spreading. “So it’s one of the first vaccine-preventable diseases to show its face when there’s under-vaccination,” Larson said. And many countries in Europe are under-vaccinated. “Italy, France and Serbia, for example, have lower child-vaccinations rates than Burundi, Rwanda and Senegal,” the Economist recently reported. To boost vaccination rates, many countries in Europe have been cracking down on vaccine-refusing parents, experimenting with fines and sanctions. And, to be clear, vaccine refusal is a problem. France, for example, has one of the highest rates of vaccine skepticism in the world: According to one study, 41 percent of people there disagreed that vaccines are safe. In Germany, it’s not unusual to go into pharmacies and find homeopathic “cures” for many ailments, or even homeopathic hospitals. “The vaccine acceptance issues are a bigger piece of the pie than they were historically,” Larson said. But Europe’s vaccine problems are much larger than anti-vaxxers. And the story of measles may be the canary in the coal mine for an infectious diseases problem that’s even more dire than it appears right now.